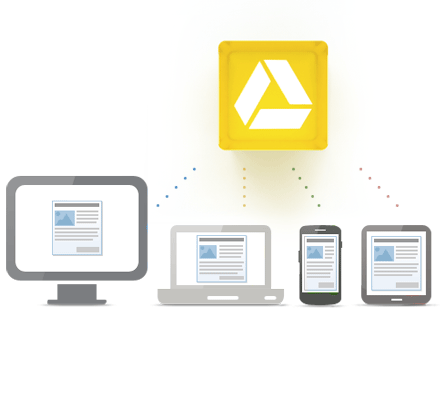 Google Drive - you can upload any type of file and you get anywhere from 25 to 100 GB of storage free. 100GB of free storage comes with Chromebooks and other products. You can purchase additional storage at extremely good rates too. There are mobile apps and desktop apps that allow automatic backup and syncing of your files. You can have files uploaded and converted to Google Docs/Sheets/Slides, or kept in their native format. This is my primary backup system with all of my files backed up to my GDrive account. Your files are available on any web-enabled device. I have Google Drive app on my laptop and smartphone and it backs up and syncs all of my files. I also have all of my smartphone files backed up automatically with Google+ and Dropbox. There are also Dropbox apps for your mobile device. You can also access the mobile site from any web-enabled phone. Imagine being able to access all of your files on your smartphone! It includes auto-backup of your photos which is a great feature. You can also share files with others. SugarSync - Sugarsync is another powerful sync and backup service. You can have it back up your files on their server, and sync the files among multiple computers. You can also access these files through any web browser, and there are apps for smart phones. You can even access them with a mobile web browser if you don't have an app. There are no more free accounts, unfortunately. Evernote - I have Evernote's desktop application at home and at work so all of my notes are backed up on my home computer and my work desktop and laptop. I also export the data once a week to an html file for backup. I do most of my work through Evernote, so this is very important to keep backed up. I also have important files in Evernote, and important records and photos. My most important files are here and in GDrive. In addition, I have my Evernote data backed up with Revert.io. Google Products - I also export my Blogger blogs, Calendar, email, tasks, and bookmarks once a week as a back up. For each of them, go to settings and look for the export command. Here's more information on how to export data from Google's services. All of the backup files are in a directory that is automatically backed up to my Google Drive account and then kept in sync on both my school and home computers. Sugarsync does this automatically, so it is no effort for me. I also have really, really important data (financial, digitized paper records, etc) on a flash drive in my fireproof safe. Just in case. My Android smart phone automatically syncs with my Google Calendar, Google Contacts and other Google services and I have my Evernote notebooks synced to it as well. I can also access all of my files on the cloud services through my smartphone.